Brazil has just 2.8 percent of the world’s population, but 46.7 percent of the world’s transgender murders. Help these activists put a stop to the violence and #SaveTransBrazil now. Imagine if one transgender person was murdered every 21 hours in the United States. The outrage would go well beyond the grave alarm felt by advocates at the six reported killings this year of Jasmine Sierra, Demarkis Stansberry, Monica Loera, Kayden Clarke, Kedarie/Kandicee Johnson, and Maya Young. But in Brazil, we don't have to imagine this horrific, overwhelming epidemic of fatal violence against transgender individuals. One transgender person truly is killed every 21 hours, according to a statement from Transgender Europe’s Trans Murder Monitoring Project emailed to my colleague Eduarda Alice Santos. She is a correspondent for Planet Transgender, an English-language hub for international transgender concerns, who also provided the image above from a "die-in" protest in Rio de Janeiro this year. Brazil has the world’s highest rate of fatal violence against transgender people. 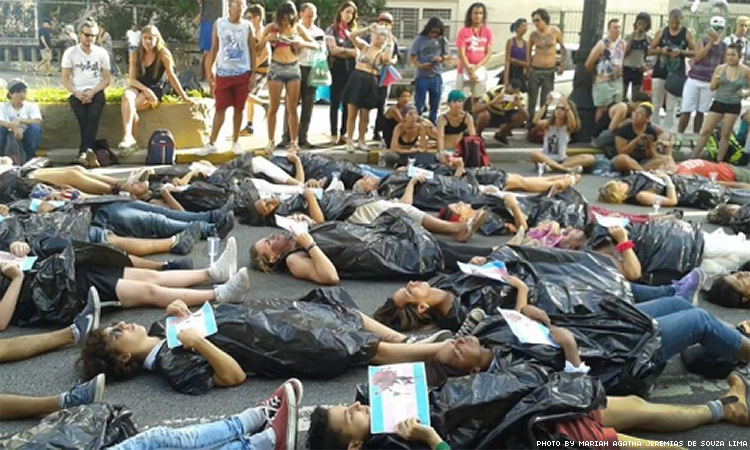 In fact, the South American nation's trans murder rate is 16.4 times higher than anywhere else on the planet. If the world overall experienced Brazil’s transgender murder rate, there would be 1,260 homicides in approximately 70 days worldwide. In a year, we would lose an estimated 6,588 transgender people to homicide. These stark realities drove my international transgender activist colleagues and I to launch a worldwide petition — with the hashtag #SaveTransBrazil for social media visibility — to pressure Brazil’s government to fight the homicides of transgender individuals in the country. We are asking the English-speaking public to sign the petition in an effort to educate ourselves about the violent realities facing transgender Brazilians, and to help change the culture of violence in Brazil. We were moved to action not just by the sheer volume of anti-trans homicides in Brazil; we knew that we must confront and expose the incredibly heinous nature of these crimes, involving some of the most heartbreaking mutilations and vicious attacks ever reported against transgender women and men. At Planet Transgender, we believe that the brutal nature of these atrocities is a part of the factual record, and while we carefully dialogue about the content of our crime reports, we must not sanitize these hate crimes. When we know the full extent of the facts, we confront our privilege in the English-speaking world. Understanding the profound level of violent hatred facing gender-variant Brazilians and allies helps worldwide advocates to know exactly what we are up against. Why have there been so many homicides of transgender people in Brazil? While it is impossible to pinpoint exact causes and effects, we can surmise that with more visibility of gender-variant people have come more attacks. Some progress has occurred for Brazilian LGBT people. Marriage equality was legalized in Brazil in 2013. To protest against anti-LGBT sentiment, last year two straight, cisgender (nontrans) actors kissed on live television at the GQ Men of the Year Awards in Rio de Janeiro. Bruno Gagliasso and João Vicente de Castro's kiss demonstrated that there’s nothing wrong with showing diverse affection across traditional gender and sexual lines. Incarcerated transgender people in Brazil are now allowed to self-identify and dictate their own gender identities. But in 2013 — the same year that Brazilians were granted the freedom to marry — lawmakers killed a bill that would have outlawed discrimination and violence on the basis of gender identity and sexual orientation nationwide. Last year Brazil's 8 million–member Universal Church of the Kingdom of God gained control of Brazil’s social conservative movement and infiltrated the country's National Congress after the October election. The party's stated goal was to reverse the 2013 court decision that brought marriage equality to the nation. While in some respects she has been a great LGBT ally, Brazilian President Dilma Rousseff has also catered to the country’s 50 million or so residents who identify as evangelical Christians. Now, according to BuzzFeed, progressive Brazilian lawmakers have sounded the alarm about a of rising tide of religious fundamentalism in the country — fundamentalism that feeds violent animus toward transgender individuals. 1. Change the culture of violence by distinguishing between transgender individuals and gay and lesbian individuals. In the Portuguese-speaking cultures of Brazil, being transgender is often conflated with gay and lesbian identity. This means that all the derivations under the “transgender umbrella” (be it transgender, transsexual, transvestite, gender-fluid or gender-nonconforming) are often lumped together with LGB identity in news reports and casual conversation. In effect, everyone is "gay" and the uniqueness of trans experiences is eroded. We must encourage Brazil’s leadership to join with national advocates pursuing improved cultural literacy about the unique experiences of those who identify as transgender. We must encourage leaders and journalists in the country to accurately identify self-affirmed trans women and men as such in their policy documents and news reports — even if the trans individuals have not been able to afford expensive gender-affirming surgeries or clinical care. Arguably, Brazilian news reports contain even more terrible deadnaming and misgendering of transgender people (using a trans person's repudiated name and the wrong pronouns, respectively) than other countries. Changing the culture of violence means honoring transgender people by identifying us respectfully and honorably — in life and in death. 2. Increase the effectiveness of police investigations of hate crimes and homicides against transgender individuals. Last year two São Paulo military police officers were suspected of lying about their roles in the beating death of 18-year-old trans woman Laura Vermont in Brazil. This incident is but the tip of the iceberg of faulty police investigations into violent crimes against transgender people in the country. Making and strengthening laws that prohibit discrimination and violence based on gender identity and sexual orientation must occur at the same time that great pressure is brought on law enforcement to bring harassers and killers to justice. Join us as we seek to save Brazilian transgender individuals from incalculable violence. KELLI ANNE BUSEY is the editor in chief of Planet Transgender and an advocate for global transgender awareness.